MANILA, Philippines - The official results, list of passers, top examinees, performance of schools and other important announcements for May 2018 Certified Public Accountant (CPA) board exams are released by the Professional Regulation Commission five (5) working days after the last day of exams. Below is the list of passers for May 2018 CPA licensure with surnames starting with letter A to H.
CPA Licensure exams is one of the programs with most number of examinees being administered by PRC. CPA exams are scheduled twice a year to cater the growing number of aspiring licensed CPAs. For 2018, CPA exams are scheduled on May 2018 and October 2018. The board exams are administered by PRC Board of Accountancy (BoA) headed by Mr. Joel L. Tan-Torres at PRC testing locations around the country specifically in Manila, Baguio, Cagayan De Oro, Cebu, Davao, Iloilo, Legazpi, Tacloban and Tuguegarao. 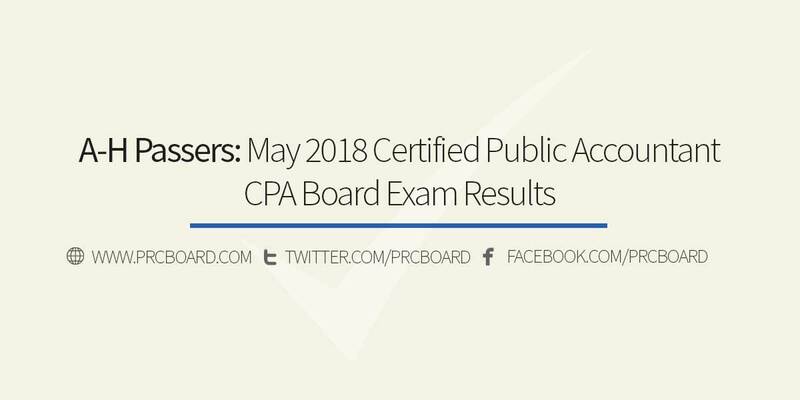 To receive updates on any announcements about May 2018 CPA board exam results, we advise our readers to bookmark this page, visit PRC official website or follow us at our social media pages via Facebook and Twitter. Advance congrats future cpa's !!!! To God be all the glory..
Sai, Jude, Ciara, Jhapz, Jen, Sarah, Kuya Ambas, Matta, Dan, Ate Yna, Rommel, Ate Faizah. Please LORD. Thank you. Sana ilabas na para mawala na kaba ko. Ako tuloy kinakabahan para sa kapatid ko na nag take. �� All is well pasado na! Ako tuloy kinakabahan para sa Sister ko. Sana ilabas na yung Result. 😇😇😇 All is well!congrats in advance mga CPA's God is good. same here am so tensed ..hope my son will get it. Goodluck to all most especially to my baby gie!!!!! In Jesus Name!!!!! Positively waiting here.. Lord pls answer my prayer! Go My Ma. Regine ❤️, in Gods will😊😇. CONGRATS IN ADVANCE TO ALL BOARD EXAM PASSERS!!! Tagal ilabas, kabado na lahat. Babyyy divine 2 na ko so dapat CPA ka na. <3 <3 <3 <3 Go NASG!!! God Bless sa mga friends ko. Go Sheila Cerezo! Congratulations in advance sister!! OO basta pag pumasa ka wag kalimutan magbalat ng patatas. Praying for Justin Endriga. Pls LORD let this be your gift to me. Lord, I'm claiming it now! My name, CPA! woooh!!! PRC bakit ang tagal? anu ba yan..
Wala pa din? Di na ko makahinga. Stay patient and trust your Journey. Im Excited .. Positive ako sa Ate ko ! GOOD LUCK GEENA PANGILINAN, SETTE YAMBAO AND ALLEN CABANTOG!!! Praying for My Niece Lord Please!!!! Ang tagal ng results ng CPA board exam baka talunin nyu pa “Ang Probinsyano” sa tagal!!! Text nyo na lang kami, PRC.Bye. Di naman ako nagkape pero kinakabahan ako ng bongga gaaaaaaawd matagal pa po ba?? Go ! Mitch Banasihan , Japeth Constantino and Nicole Parducho. Can't wait for the result. . .Best prayers to all. Still waiting. Advanced congratulations to the new CPAs !!! I was here a year ago and ngayon CPA na ako. Hopefully, my friends and schoolmates will pass this time of year too! God bless to all! patiently waiting here Oh Lord! baka 11:59 PM released ng results. xempre May 28 prin. Hoy. Jesas. Asa nang result? Kadugay ba. Nangugat namig hinulat hhooooyyyy. Go Aurelius Arriesgado and Sergio Ceniza!! Go DLSU BSA 113 Block 7!!! NEXT NA KAMI,CPA OCT 2018!!! Praying for my cousin. Hoping for her name to be in the Passers' list. God bless Ria!! Our family's first CPA!!! Isang araw na akong ng-aabang sa internet cafe dito! Antagal man ba?! Sana Sinabi niyo nalang PRC na May 28 ng gabi irerelease or May 29 ng madaling araw, kesa nalalanta ako dito! Antagal nmn ng result. Sana nagbigay ng estimated time. May your will be done Lord! When God works, it's worth the wait! Good luck everyone! Ano naaaa PRC? Ang tagal. He makes all things beautiful in HIS TIME! Patiently waiting Lord! I trust in you!. All for your Glory Lord! ANG TAGAL! AATAKIHIN NA AKO SA PUSO! Good luck fharrabee in shaa Allah your name will be on the list. My mom stayed late at night hanggang madalingg para makita ang result all day kaming nakatutok dito. Pls. I hope marelease na as soon as possible. I hope it is worth the wait. Go JEN !! Whoooo !! Fighting ! Mga 11:59PM pa lalabas....masabi lang na May 28...hahaha! Go Jakeyyy!!!! Kaya mo yan!!! Praying and hoping the best results! 💖💖💗 Iloveyou, kahit di mo ako love.